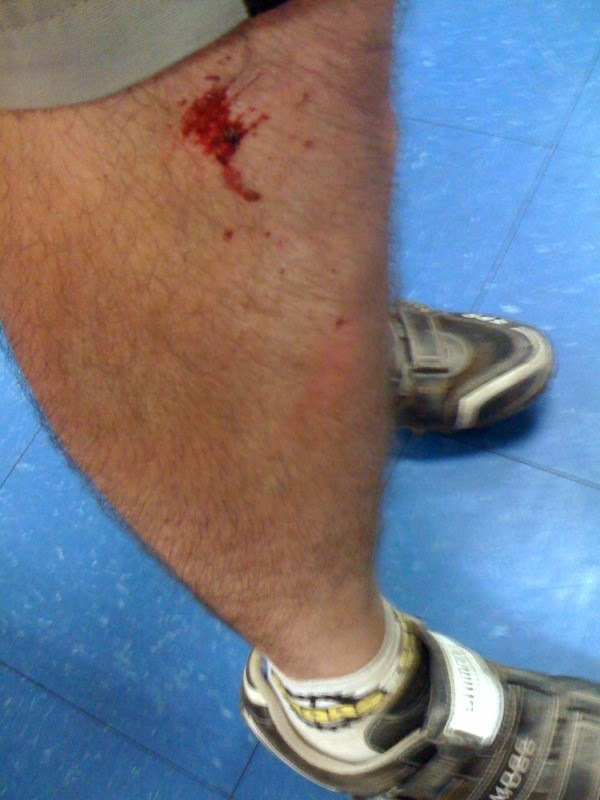 When you mountain bike often enough crashing is simply a part of the experience. Taken with my phone, in the local Taqueria we eat at after riding – with the sweet blue tiles, it doesn’t look like much – only a scratch. I’d been riding with my friends Keith, Trent and Charitable Phil. All had been smoking me. I was lagging behind, just not feeling up to snuff – hate it when that happens. My last ride had been a fairly good one, but this one not so much. We were at the funnest part of the ride, the long downhill called the Goat Trail. It’s a mile long downhill with some really nice single track and a few precarious fast switch back turns. No, I didn’t fall on one of the fast, hard spots. At the top of the hill Keith took off first and we waited a few seconds so as to not catch up and ram him from behind. I went second. I went fast around the first corner and then down a large hill with a few bumps. It was getting dark and I had glasses on, which usually help me see better due to the way they are tinted. Now that it was getting darker though, I was having a hard time telling where the dips were. I launched off a few jumps down that first hill and then started up a second hill. It’s mid way up this hill where there’s a large bump in the road, and if you have enough speed from the downhill you just finished you can catch a bit of air. I pre-loaded (pushed down on my suspension) just before the bump and launched off the bump. Since my speed was slowing down, my vision was getting worse and I’d already had an off day I wasn’t able to pull out of the bad landing. Unfortunately I turned a bad landing into a catastrophic landing and fell on my side. Ugh. It stinks falling on hard pack. I was covered in dirt and scratched my leg. I got up, dusted myself off. Fortunately no one had caught up to me to see my doofishness, put the marks of the fall were obvious for anyone to see. At the bottom of the hill I sheepishly fessed up to the fall in the lamest place. My friends were all great, stating the many Stooopider places they’d fallen and dumber things they’d done. Great guys to make me feel good at a time I was feeling pretty low. Got to take my bike in to the shop now, things are a little off. Time for a check up.